German Christian theologian and Hebraist; born at Kletterberg July 26, 1668; died at Halle March 10, 1738. He studied Ethiopic under Ludolf at Frankfort-on-the-Main, and became assistant professor of Oriental languages at Halle in 1699 and professor of theology in 1709. His chief work was a text of the Hebrew Bible founded on Jablonski, but with a comparison of nineteen printed editions and five manuscripts of Erfurt. This was published in 1720 at Frankfort-on-the-Main and was reprinted throughout the eighteenth century. Some of his critical annotations were published separately in the same year. 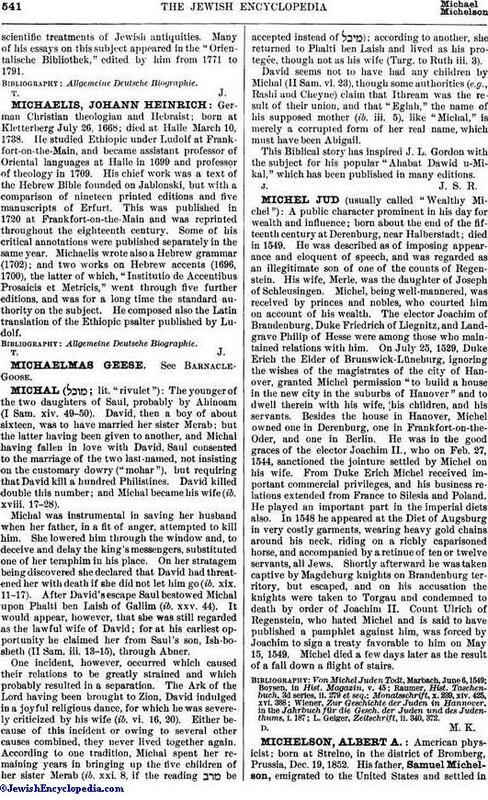 Michaelis wrote also a Hebrew grammar (1702); and two works on Hebrew accents (1696, 1700), the latter of which, "Institutio de Accentibus Prosaicis et Metricis," went through five further editions, and was for a long time the standard authority on the subject. He composed also the Latin translation of the Ethiopic psalter published by Ludolf.